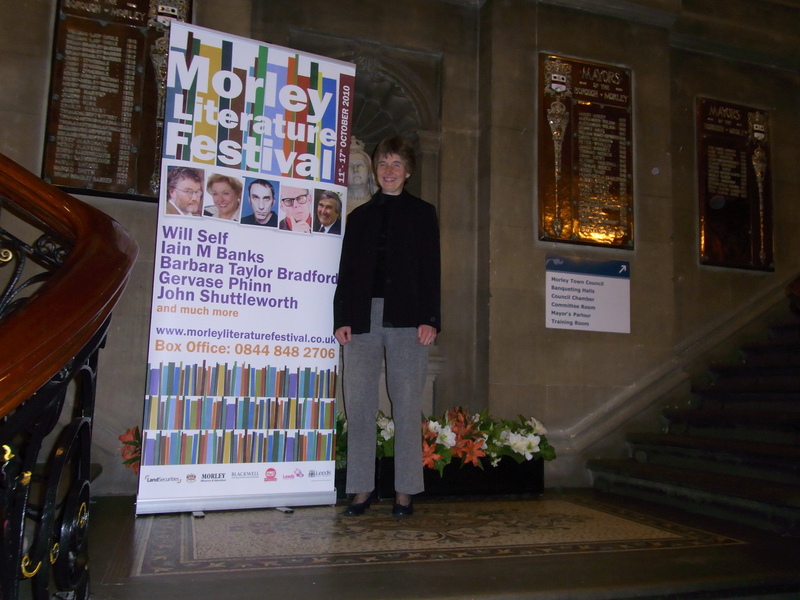 On Saturday I went to Morley in Yorkshire to collect my certificate for the Friends of Morley Literature Festival Short Story Competition. It was a lovely evening which featured Andrew McMillan (not sure if he’s any relation to Ian) reading poetry that had been written for a special project undertaken in conjunction with the Literature Festival. Four families in the area chose paintings from Leeds Art Gallery to hang in their homes for 3 months. Andrew went out to visit these families and talk to them about how they felt about the art works. He then used these conversations as triggers for poems. Three local schools also chose pictures to hang in their classrooms for a similar project but this time the children wrote the poems with Andrew acting as their mentor. Andrew has a wonderful way of performing poetry and he brought the children’s colourful language & unusual ideas to life with his gestures, timing and strong regional accent. Similarly, hearing him read his own poems made them so much more vivid (for a non-poet like me) than simply reading words on a page. So, to be a successful poet do you have to be able to perform with panache and carry the audience with your words? Or can you succeed as a shrinking violet? I imagine that few people buy books of poetry these days and therefore a confident performance is essential to build a following. The evening continued with a gig by the comedian Arthur Smith (of Grumpy Old Men). He was brilliant but surprised me by including poems (which he knew off by heart) in his act. My favourite was The Mower by Philip Larkin, which is a rather sad tale about a hedgehog. Also – until midnight on Friday (14th October 2011) I am donating £1 to the RNIB for each new subscriber to this blog. Simply enter your email address in the box on the right – it’s free and you can unsubscribe at any time. More information is here. This entry was posted on October 10, 2011, 11:00 am and is filed under Competitions, Events, Poetry, Successes, Uncategorized. You can follow any responses to this entry through RSS 2.0. You can leave a response, or trackback from your own site. Sounds like you had a great night. Bet you’ll get that certificate framed and in the centre of your room. Well done. Thanks, Susan – the certificate is already framed & on my mantelpiece! Congratulations again on your success in this competition. Thanks, Patsy(hope I haven’t gone on about it too much!). Sally, congratulations on your short story success. That event sounded very good! Performance poetry – when it’s done well – is great. A kind of cross between stand-up comedy and acting (something like that, anyway). I read the other day that poetry is going through something of a revival – hurrah for that.